If you are looking for San Diego Airport Parking it is worthwhile pre-booking at one of the independent San Diego airport parking lots, instead of leaving it until the day you travel. During peak times, the car parks at San Diego airport can become extremely busy and after you spend a large amount of time looking for a free space, you will then pay a premium for it. ParkVia have done the pre-work for and brought together some of the best services around. Before you book your San Diego airport parking, you can compare prices, security features, operating hours and other services available on one web page. The San Diego airport parking lots we show are close to the airport and include free shuttle transfers between the airport departures / arrivals drop off. When you have decided the best choice for you, it is a simple process to book this San Diego car parking service. Complete the booking form on this page, select the car park of your choice, and then complete the details required. This includes your name, cell phone number, vehicle licence plate and an email address. Then you pay a small deposit to reserve the parking which is taken off the total of parking. You will pay the balance when you will arrive at your San Diego airport parking lot. There are NO HIDDEN CHARGES and NO BOOKING FEE. 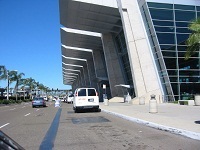 San Diego International Airport is also known as Lindbergh Fieldand. It is located 3 miles (4.8 km) Northwest of San Diego central business district of California and 20 miles (32 km) from the Mexican border in Tijuana.